We’re unique (and effective) because we combine card technology with full-featured transaction management software and our program management expertise. Founded in 1998 by Jeffrey Venick and Michael Stappler, we’re based in Baltimore, MD and serve state and local government agencies in addition to corporate clients nationwide. To learn more about how we can save you money and improve service, call (866) 664-1277 or contact us. Meet the challenges of shrinking budgets, rising costs and strict reporting requirements with MJM’s transportation software and transportation management software services, including transit fare collection software, paratransit software, cashless payment systems for taxis, driver pay cards for transportation fleets, stored value cards for employee and contractor payroll and gift cards, and voucher scan software to eliminate cumbersome paperwork. You exist to help the elderly, but much of your time, as well as valuable resources, is devoted to repetitive data entry, applications for grants and other funding, and detailed reports for regulators and decision makers. How can you provide stakeholders with the assurances they need, while still saving money and labor for direct client service? Our senior center and aging software will help you track participants activities with swipe card technology. Our outsourced senior center and congregate site management services will help you gain control of costs and reporting. 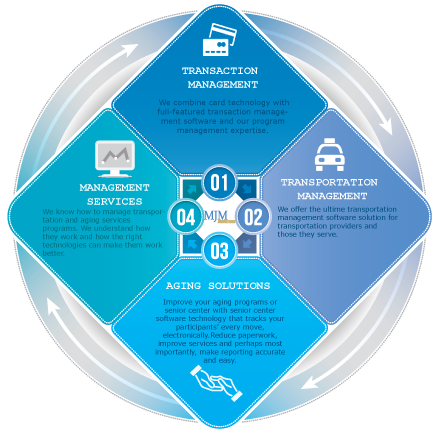 Our transaction management expertise helps companies improve services, fulfill reporting requirements, and convert from paper based systems to electronic data capture and transaction processing.